What: In a battle of struggling teams, the Blizzard head to Southern California to meet the Strike Force. When: Sunday, March 24 at 3:05 p.m. pacific (5:05 p.m. central). Where: Pechanga Arena San Diego; San Diego, California. 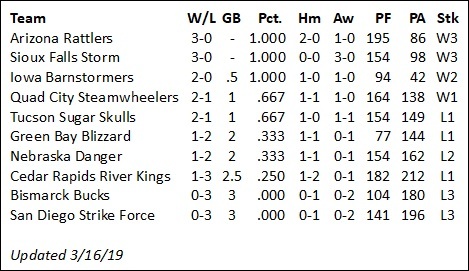 Note: The Strike Force have re-tooled their front office, with new general manager Ryan Eucker moving over from his identical role with the Cedar Rapids River Kings. The Strike Force and River Kings are owed by the same ownership group, led by Roy Choi. The Blizzard are 1-2 overall and 0-1 on the road. They are coming off a 41-3 road loss to the Iowa Barnstormers on March 9. The Strike Force are 0-3 overall and 0-1 at home. They are coming off a 62-42 road loss to the Tucson Sugar Skulls on March 10. Blizzard RB Rameses Owen and WR/DB B.J. Hill. Strike Force WR David Carter. With both teams coming off bye weeks, this is a time for each to regroup and straighten out their respective seasons. 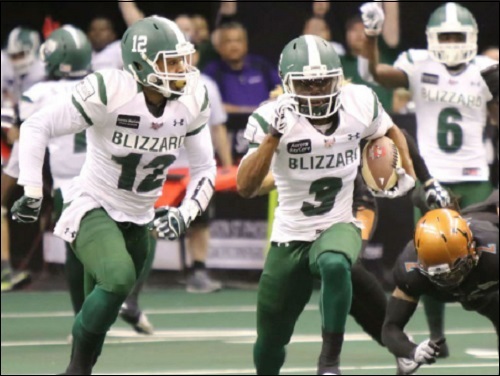 Other than their week 2 win over the Nebraska Danger, the Blizzard have had a rough go of it. 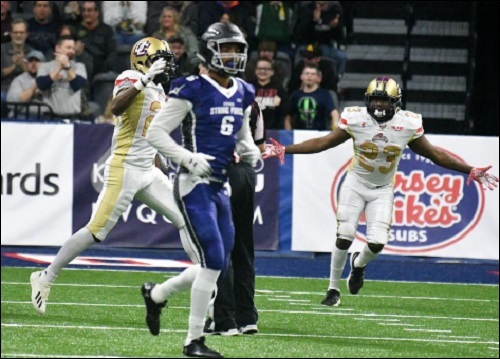 They dropped the season opener by 30 points to the Arizona Rattlers then, scored a franchise-low three points in a 41-3 loss to the Iowa Barnstormers in week 3. Their game against the Danger was a back-and-forth slug fest which ended with quarterback Lenorris Footman's six-yard run with 25 seconds left to seal the 53-52 win. 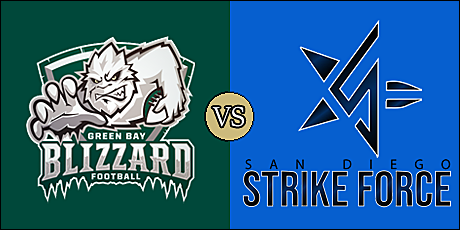 The Strike Force have had a rough go of it thus far and share the IFL's worst mark with the Bismarck Bucks at 0-3. This week marks the first in which Ryan Eucker, now former general manager of the Cedar Rapid River Kings, has assumed the same role with the Strike Force. It's much of a lateral move given that both teams are owned by the same ownership group. Eucker has the chance to right the ship, something which he was working on successfully in Cedar Rapids, and previously the Spokane Shock/Empire. Lenorris Footman is more dangerous with his feet than in the passing game. He is second in the IFL (first among quarterbacks) with 71.3 rushing yards per game and has five visits to the end zone. He's completed just 42.3 percent of his passes with three touchdowns and five interceptions. Justin Billiot, who started the opener before being pulled early in the first quarter, is the only other QB on the roster.Running back Kamas Cass is the next running threat on the roster. with 19 rushes for 65 yards and a touchdown. B.J. Hill is a true triple threat player, who can line up on offense, defense and special teams. He's been converted from a DB to a wide receiver and has nine receptions for 145 yards and a touchdown, as well as a rushing touchdown. Levi Copelin has 11 catches for 106 yards, and Kezlow Smith adds two receiving scores to the group. Defensive backs Jadar Johnson and Marquez Gollman, and linebacker Dayshawn Taylor each have 18 total tackles on the season. Gollman has a pair of interceptions and a fumble recovery. Defensive lineman Truett Box is tied for third in the league with 1.5 sacks. Former Barnstormer Cody Barber is a perfect eight of eight on point after tries and three of six on field goal attempts with a long of 33 yards. The good news for the Strike Force is that they're averaging a respectable 47 points per game. The bad news is that they're giving up nearly 19 points more per game. Derrick Bernard is averaging nearly 200 passing yards per game while completing 51.5 percent of his passes with 11 touchdowns and a league-high six interceptions. Aside from the picks, those are decent numbers. The problem, though, is the rushing game where San Diego averages just 27 yards per game. Bernard has rushed for two touchdowns and George Moreira has four trips to the end zone. Julian Stafford comes in with 16 catches for 194 yards and is second-best in the IFL with six touchdowns. Marques Rodgers leads in receiving yards with 227 off 15 receptions and a pair of touchdowns. Defensive back Kenric Young, Jr. has 19 total tackles on the season, while fellow DB Timothy Moten comes in with 18. Linebacker Mikell Mair has 13 and a forced fumble. Defensive lineman Terrence Fullum has the team's only sack, and DB Sean Potts-Harris has a fumble recovery, which he returned 48 yards for a touchdown. Ernesto Lacayo has nailed all 18 of his point after tries and is three of five on field goal attempts with a long of 31 yards. I think this is going to be an interesting game. I know they're not at the top of the standings, but either one could make a pretty decent showing. Green Bay will receive the opening kickoff. Touchdown Blizzard. Levi Copelin 24 yard pass from Lenorris Footman. Cody Barber kick failed. Touchdown Strike Force. Derrick Bernard 2 yard run. Ernesto Lacayo kick. Green Bay has already scored twice as much as they scored in their last game! Touchdown Blizzard. B.J. Hill 2 yard pass from Lenorris Footman. Cody Barber kick. Touchdown Strike Force. Julian Stafford 3 yard pass from Derrick Bernard. Ernesto Lacayo kick. Touchdown Blizzard. Rameses Owens 24 yard run. Cody Barber kick. Touchdown Strike Force. Julian Stafford 30 yard pass from Derrick Bernard. Ernesto Lacayo kick. Pretty exciting quarter, especially if you love offense. Turnover on downs by the Blizzard. Touchdown Strike Force. Marques Rodgers 19 yard pass from Derrick Bernard. Ernesto Lacayo kick. Touchdown Blizzard. Lenorris Footman 6 yard run. Cody Barber kick.